Discount Oil of Keene operates https://discountoilofkeene.com, the Discount Oil of Keene mobile app and portals. We are the sole owner of all information gathered on these sites. It is our policy to respect and protect your privacy in the manner outlined in this document. Discount Oil of Keene collects a variety of non-personally identifying information as is regularly and routinely provided by web browsers and services, including but not limited to your IP address, cookie information, page(s) visited, browser type, referring site, and similar data. This information may be aggregated and used in reports that review website, account portal or mobile app traffic and user behavior or identify modifications that will enhance the visitor experience. These reports may be shared with staff, vendors, business partners or the public. Discount Oil of Keene does not collect personally identifiable information unless it has been provided voluntarily. This may include your name, address, phone number, account number, credit card or bank information, and purchase history, among other information which may be used to directly identify you. We do not sell or rent your personal information to third parties for financial gain in the ordinary course of doing business. Your information may be utilized to secure your account information, provide products or services, fulfill orders, respond to requests, or provide additional services. By registering with our website, account portal or mobile app, submitting forms or otherwise providing your information to Discount Oil of Keene, you authorize us to contact you regarding promotions, new products and services, company news, and other messaging. Should you wish to be excluded from these communications, please submit your request in writing or via email (see below). The security of your Personal Information is important to us, and we strive to implement and maintain reasonable, commercially acceptable security procedures and practices appropriate to the nature of the information we store, in order to protect it from unauthorized access, destruction, use, modification, or disclosure. Please be aware that no method of transmission over the internet or method of electronic storage is 100% secure and we are unable to guarantee the absolute security of the Personal Information we have collected from you. We may require a user name and password for you to access certain sections of the website; account portal or mobile app. Discount Oil of Keene does not disclose that information to third parties. 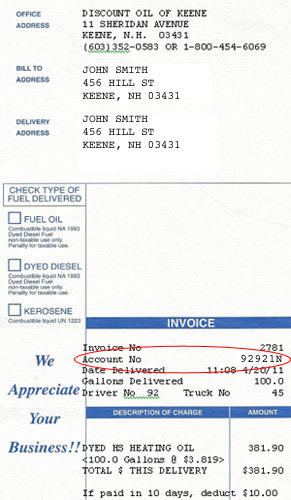 Your password is encrypted and Discount Oil of Keene does not have access to it. As such, you are responsible for the security of your password. Automated mechanisms have been put into place to enable you to reset a lost or forgotten password, provided you are able to appropriately confirm your identity as the account holder. 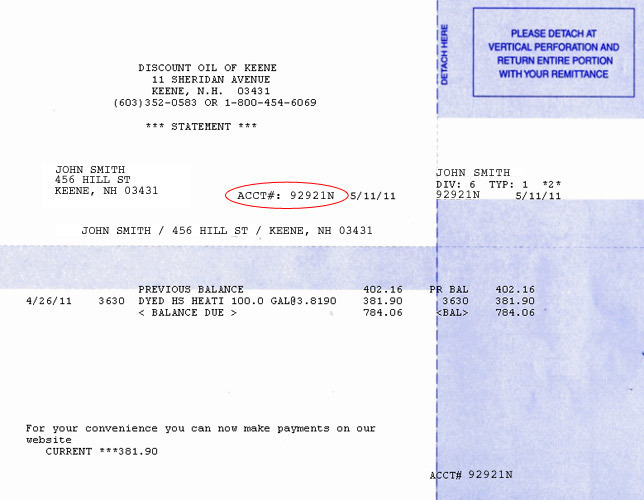 Discount Oil of Keene may share your Personal Information with employees, contractors, subsidiaries and affiliated organizations in the course of legitimate business purposes in order to: fulfill requests or orders, provide customer service, or maintain the operations of the website, account portal or mobile app. Discount Oil of Keene will disclose Personal Information in response to a subpoena, court order or government request, or as otherwise required by federal or state law; or if Discount Oil of Keene believes in good faith that disclosure is reasonably necessary to protect the company, third parties, or the public at large. You have the right to review a copy of the Personal Information collected by Discount Oil of Keene and request that it be corrected or deleted. Please contact us as directed below to request a copy of your personal information.